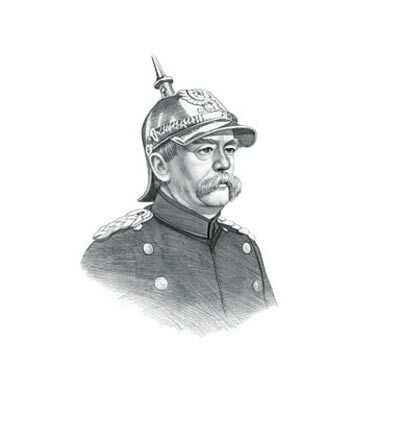 This short Otto Von Bismarck Speech - Blood and Iron featured is in the form of a transcript, extract, passages or lines and demonstrates the good oratory skills of a great public speaker with the ability to use clear words and text. Speech Example Topic / Subject Type: Inspirational / Inspiring Speech. "Not by speeches and decisions of the majorities will the greatest problems of the time be decided." The Conflict is viewed too tragically, and presented too tragically in the press; the regime does not seek war. If the crisis can be ended with honor, the regime will gladly do so. The great independence of the individual makes it difficult in Prussia to rule under the Constitution. In France it is otherwise; there, individual independence is lacking. The constitutional crisis, however, is no shame, but rather an honor. We are perhaps too educated to put up with a constitution - we are too critical. Public opinion wavers; the press is not public opinion; we know how that arises. There are too many Catilines, who have revolution at heart. The members [of the House], however, have the task of standing over public sentiment, and of guiding it. Our blood is too hot, we prefer armor too great for our small body to carry, but we should put it to service. Germany does not look to Prussia's liberalism, but to its power. Bavaria, Wurttemberg, and Baden would like to turn to liberalism, but they shall not assume Prussia's role. Prussia must collect its forces for the favorable occasion, which has several times been neglected; Prussia's borders are not favorable to a healthy national life. Not by speeches and decisions of majorities will the greatest problems of the time be decided - that was the mistake of 1848-49 - but by iron and blood. This olive branch (he drew it from his memorandum book) I picked up in Avignon, to offer, as a symbol of peace, to the popular party: I see, however, that it is still not the time for it. This famous short Otto Von Bismarck Speech - Blood and Iron is a great example of a clear address using excellent text to persuade and inspire the audience by a natural leader and motivator. Use this famous short transcript of the Otto Von Bismarck Speech - Blood and Iron as an example of a great oration and clear dialogue. A Quote or extract from this short Otto Von Bismarck Speech - Blood and Iron, provides an illustration of, or allusion to, the famous events the era. This famous short Otto Von Bismarck Speech - Blood and Iron is famed for its powers of verbal communication making good use of the words and language to illustrate the subject. Whether this short address can be described in the category of powerful, persuasive, motivational or inspirational speeches the excellent powers of oration which are used makes it a famous short speech.